Very nice, clean and clever solution sir!!! Good job. Thanks for the simplicity. I was testing with click triggerType, then af:popup wasn't opening for me, at least in Safari browser. 3. If we engage there some business rules, error messages act very weird.. sometimes they showup, sometime they just blink the screen and return field to the previous value. Sometimes it shows double error (business rule error message and mandatory message). 4. 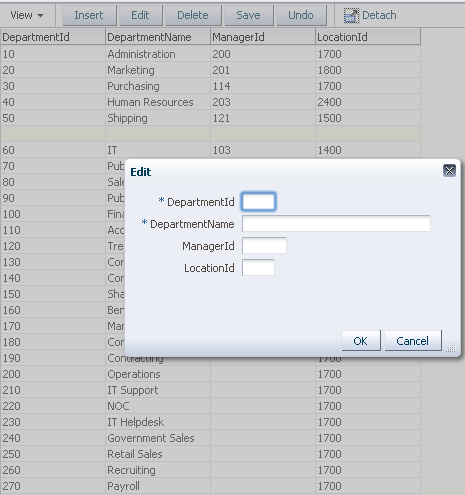 If I try to insert record and business rule exception occurs, sometimes it shows exception, sometimes it just erases field and I can see row with empty mandatory field being added to the table on background, however if I press cancel this field dissapears. Any comments about it ? 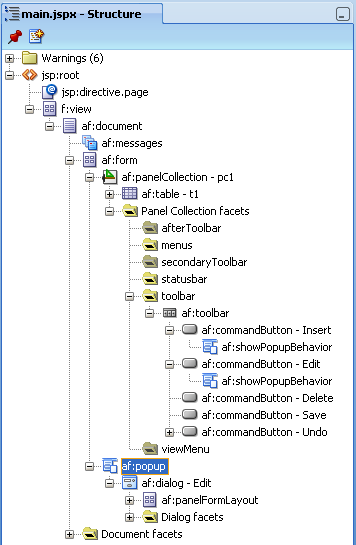 All these described are typical wrong usage of ADF functionality. You should read dev guide about these features. For example, table refresh is done, because auto ppr is enabled on iterator, you can disabled it, if dont want to refresh related operators automatically. this create adn edit method are owrking for adf table. do we have a similar method for adf tree table crate / edit both child and parent nodes.. Yes, you can check in ADF Faces Components demo application. Also you can download source code and see example. Thank you very much! Just what i need! i have opened popup with data editors, input some data with errors, press "OK" button on popup dialog, errors and red borders appears. Then press "Cancel" button and dialog closed (on Cancel Listener have exec "Rollback" operations). But: error balloon still on screen and reappears each time when i click on any table row. How to rid of this balloon? Or I doing something wrong? Are you getting this with my sample app, or inside your app? 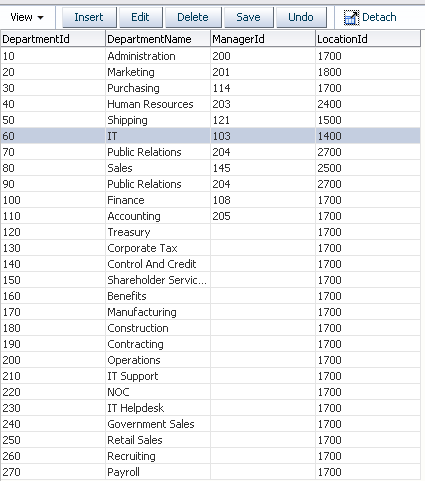 This happens in my test app - one table in database, one entity, one view. Only difference - table and popup placed in page fragment, which rendered in region on "dictionary" page. Thank you very much for this information, its exactly what I need. I'm struggling with one thing though, the close icon of the popup itself. The returnlistener isn't notified when the popup is closed with that button, and I can't find where to disable it. When you now click the insert button, and then immediately close the popup with its close button, you're left with an empty (and possibly invalid) row which isn't rolled back. Do you know how to workaround this? This is the same thing I am looking for.. Please do let me know if you got this issue under control.. I believe, you can find it in Oracle ADF Developer Guide, check View Criteria section. and first facet has links and when user clicks links on first facet the corresponding jsp pages in second facet should change. i have a panel splitter with two facets and have links on first facet when the user clicks on links present in first facet the corresponding jsp pages shud be changed in second facet. I guess you can achieve this with PartialTrigger functionality. Can u pls provide me some sample example as iam unable to get this . Didn't reproduced. 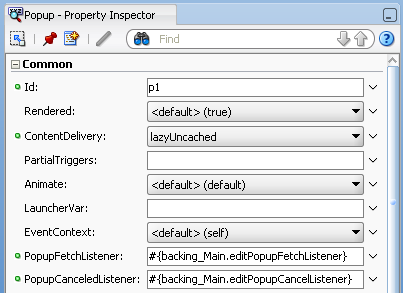 For me popupCanceledListener is called only when pressing keyboard Cancel button or built-in Cancel button. It is called when closing popup with X. In all other cases, not called. You can implement this functionality in Backing Bean method. I am trying to add rows to a child table using createinsert operation of the child table within a popup. The trouble im having is that on clicking the createinsert (ADF button) the popup closes. But the button performs its task. Is there any way i can make the popup refresh on the press of the button? Is there any way of making the popup refresh on the press of a button?? I was able to implement your approach in my application, however I have the following problem. 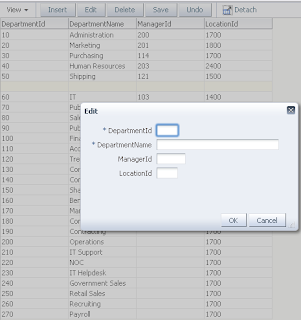 I require some fields to be set by default, and not have every field of the table as an input text field. What is the best way to set these properties? If I could only call CreateWithParameters and set the parameters in this same method prior to calling execute, that would be exactly what I need. Perhaps, if you know a better way to call this function programmatically, please share. Yes of course, you can call CreateWithParams programmatically as you are describing. 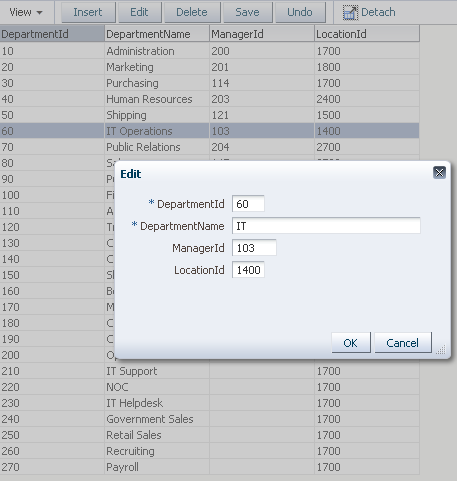 In order to set parameter values programmatically as well, make sure to use correct EL for NDValus field for NamedData (for example reference value from Request Scope, set before invoking action). however, after rollback is done, the row I get is always null. I suspect this is because the current row is dropped to the position before the first row. How can I solve this problem, so I can revert the 'CreateInsert' AND also change the dropdown status back to it's original value? I'm new in ADF, sorry if this question is Dummy. I'm trying to implement this example, the difference is that mi View Object has a where condition with a parameter (because i need to show some data of the table, not all of them). Also, in the bindings section, I have an ExecuteWithParams action and an InvoqueAction with always refresh to show the data when the page load. When I try to add a new record with the popup, it always edit the first record of the table. 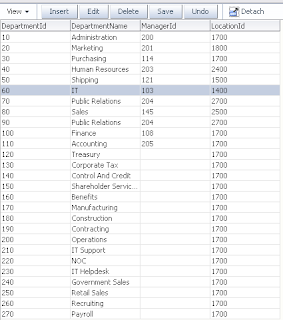 What should i do to show the filtered data and insert new rows with the popup?. Looks like row selection is not executing correctly. i'm trying to reproduce this example in HR shema using ADF 11.1.2.1 and keep geting a strange mistake: every time Insert button is pressed, popup is showing with a blank row following a message "Error: A value is required" for each required attribute. Like some kind of submit is invoked, but I'm not able to resolve this. Can you help me? example. When I try to add a new record with the popup, the popup fields are non-editable. What can be the mistake? 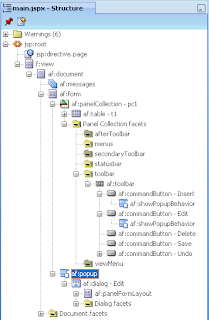 I guess you forgot to call CreateInsert operation as Task Flow initializer method, before loading fragment in the popup. Actually, it looks like the step to add CreateInsert to the page's binding's is missing. Once I did that I was able to replicate the page just fine. Just go to your pages bindings table and add the CreateInsert operation. 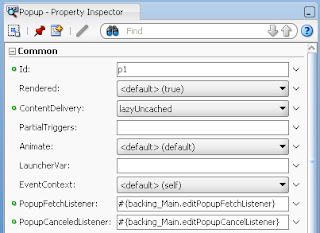 We plan to use many CreateEdit popop windows for CRUD operations (like in Your example). I also found example where Edit Page and Bounded TaskFlow as Popup are used. Just I wonder, which method is recommended to use. What are advantages and disadvantages? Is it possible to invoke the popup on mouse over over a table row? Hi. i'm new on adf world and im trying to call CreateWithParams from backing bean, to catch exception and execute rollback method. 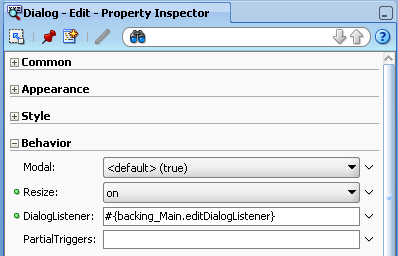 Or you can help me to call rollback method on entity validator and call rollback without losing current row?